How was the band formed? The two original members in the band, Marty and Clarrie, met through a mutual friend and decided to start a music project. In the end they just decided to form a regular band and that’s how it all started. Clarrie writes most of the music and lyrics and usually books the shows too. Sometimes Ashley also contributes music and lyrics, as does Cameron. The band is trying to write more music as a whole band collaborative effort, though. What were the ambitions of the band when you started? The Prophets of Impending Doom never really had any ambitions, ideals, or goals when they first started out. We’re happy just making music, but we’re also trying to make ourselves a well-established name in the Adelaide music scene, and from there try to establish ourselves in the wider Australian music scene. Could you explain your music to someone that haven't heard you? That’s a bit difficult. We all come from different musical background, some of us have jazz background, some used to be in thrash metal and death metal bands, so our resulting style is such a mish-mash of genres it’s hard to put our songs under a single genre or categorization. I guess you could say there’s always plenty of cowbell, explosive brass, and crazy riffs. Where was your first gig? Our first gig was in a competition so it doesn’t really count. It was at the National Campus Band Competition, the first round was at Adelaide Unibar. Our first proper gig was one or two weeks later at the Crown and Anchor which is in Adelaide’s CBD. Where was the latest gig? Our most recent gig was at the Producers Bar. It was actually our EP launch. We have some potential gigs coming up in October and November as well. Who writes your songs?/Who writes the music who writes lyrics? For the most part, that would be Clarrie (trumpet/vocals). Writes the song, prints out parts, and brings them to rehearsal, then the whole band rehearses them. Sometimes other people write the music, sometimes the whole band has a jam and we make a song out of it. It’s mostly Clarrie who writes the lyrics though. Who has the best sense of humor in the band? Oh, that’s hard to say. I can’t really answer that one. What's good/bad with the band?/What genre do you feel you are? As I said before, it’s hard to categorize us into a single genre. I’d say we are heavily rooted in ska-punk/3rd wave, but we incorporate swing, latin, punk, thrash metal, a little bit of prog rock, and we chuck some silly lyrics in too. Why did you pick that particular style?/What are your songs about? It was Clarrie’s band to start with, and ska-punk was the style he enjoyed most so the earlier songs were fairly standard ska-punk kinda stuff. As more musicians entered the fold, and as Clarrie’s musical knowledge (and iTunes library) expanded, the other influences kept popping, and it worked so we went with it. Do you write your own material or mainly covers? We play our own material, we tried a few covers in the early days but they didn’t go down too well so we dropped the idea. We’re a lot better now and we might try playing some covers in the near future. Have you made any albums?/If yes what are they? No albums, but we have two EPs, called The Suppering, and A Baby Ate My Dingo, and a demo. All of these are on our bandcamp website. How old are you?/What got you started in music? Our youngest member is Koen, who is 20, and our oldest is Danni at 23. The rest of us are all between that age. Most of us are 21 or 22. At what age did you start playing? I (Clarrie) can’t speak for the others but I started playing trumpet when I was 10. So I’ve been playing the trumpet for 12 years now. How old were you guys when you first stood on stage? It was three years ago. So the band’s ages were all between 17-20. What year was the band started? Technically, it was formed in 2010, but we never started really rehearsing or gigging until the next year in 2011. Where have you played from then till now? Mostly venues in Adelaide’s CBD, eg. Enigma Bar, Crown and Anchor, Worldsend, Producers Bar. We’ve also played a handful of shows in Sydney and Melbourne. Is it always the same songs live? We’ve cut a few songs recently, and rehearsing new songs is fairly slow. It is mostly the same songs, although we’ve recently added one or two, and we rotate the lesser-known songs and change the order up to keep it fresh. What has been the best/most promising gig so far? We’ve played with the Resignators before, which was a good show to play since they’re a pretty big name in Australia. We’ve also had some good crowds at our EP launches and there was a HUGE crowd we had at a particular gig in Sydney. Have you had any bigger tours from start to now? We’ve only had one actual tour which was mildly successful. We need to raise money for another since we enjoyed it, but we don’t have the money currently to go on tour. How big crowds do you usually play for? Depends on the day and time. Sometimes the venues look pretty packed out, other times we’re playing to a handful of people. We have some regular people who always come so we’re never playing to an empty room. It also depends on how well the show has been promoted - sometime bands we play with don’t promote the show and those shows are usually the least fun - we really need an audience in front of us to play a good show. What are your goals with your music? We’d like to be recognized as a big name for Australian ska. Some of the bigger names in the Australian scene are Los Capitanes, Area 7, the Resignators, and Chris Duke and the Royals. We’d like to be considered on the same level as them. What are your sources of inspiration? I like to listen to bands that have less serious lyrics and/or don’t take themselves too seriously, eg. B-52s, Electric Six, The Aquabats! and the Beards. Other than that, I mainly draw on folk metal and ska bands for inspiration. What's the first step when making a new song? Well, I generally play all the parts using a MIDI keyboard and record it into Garageband (super basic recording program) on my Mac so I can hear all the parts together as a whole, then I transcribe it into Sibelius (music writing program), print out the individual parts, then we all learn it together at rehearsal. Sometimes it’s a little different, but that’s generally the way we do it. How do you feel about the downloading of music instead of buying albums? Call me old-fashioned, but I like to have a hardcopy CD of the music I love. What would be your dreams for the band? I’d love to be big enough so that we could tour Europe and the US. Besides your own music, what genres and bands do you listen to? We all listen to a huge variety of stuff. Prog rock, death metal, djent, folk metal, pop punk, punk, indie, trance, ska… I could go on. When you are on stage, what do you fear most then? Equipment failure. There’s no real stage fright anymore or anything, but there’s nothing worse than being super ready to play and then not being able to due to the faults of technology. Have you been in any other bands? Most of us have been in school concert bands and the like, some of us have been in one or two other bands before this one, and then you have people like me (Clarrie) and Ashley. I’m in four bands including this one (though I consider this my ‘main’ band), and Ashley is in three bands. How important are your fans? Fans are incredibly important. They’re the audience. Without an audience, you’re nothing. They contribute to the atmosphere and energy onstage. It’s important to play music you like, but it’s also important to make sure your fans like it too. How often do you rehearse? Once a week. That’s the bare minimum requirement for a band if you want to play good shows again and again. Sometimes we have to call it off because people have work, or are sick, or have commitments they can’t get out of, but we’re fairly consistent with our practice. Where do you rehearse? We practice in a shed behind one of our members’ house. It’s good because it’s a decent practice space and it’s free, too. 1. Bad Grammar is a Syntax. 1 because I feel it’s one of the best songs I’ve written to date, and 2 because the newly-rewritten lyrics still sound strange but work so well with the music, it’s letting me see the song from a different perspective. What do you feel is the best live band you've seen? That’s a hard question to answer straight up because there are so many factors to consider. One of my picks would be the Bennies from Melbourne, because their music is loud, fast, and (mostly) ska, which I love, and their stage presence is awesome, they can whip the crowd into a frenzy. It’s not surprising they’ve had so much success just within the last year. As for local Adelaide bands, I give Slick Arnold my vote every time. Pretty young guys but their music is super fresh and intense. They’re great to watch. What are the biggest obstacles for a band? When you’re first starting out, not having any idea on what to do, having no contacts in the music scene. That was the hardest. We were lucky in that we scored a spot on a competition and the guy doing sound happened to be a fairly well-know name on the Adelaide music scene and helped us out by booking us for a lot of shows. Tell us about upcoming gigs and why we should be at them? You haven’t heard us properly until you’ve heard us live, on the stage is where our endless energy is. It’s hard to translate that energy to a static recording. We’re loud, fast, and the music hits you so much harder and in a better way. November 13th at the Crown and Anchor, Adelaide. How would you describe your sound in one sentence? 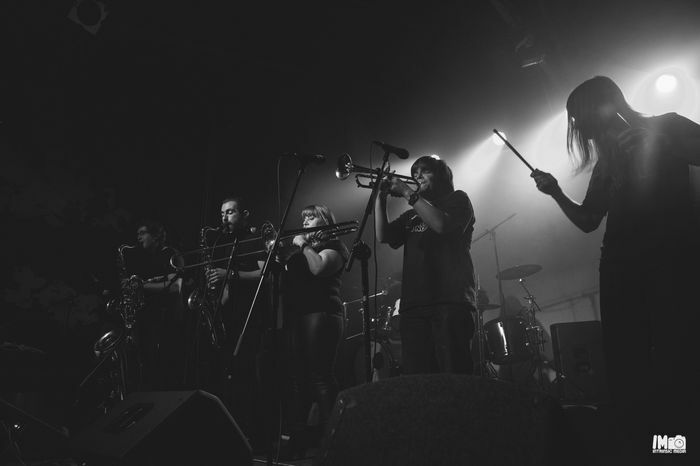 Metal-infused ska, with a hint of jazz, jam-packed with explosive horns. What is your favorite crappy instrument? There’s no such thing as a crappy instrument. In the hands of the right person, any instrument can be great. Even recorders. Whats your Pre-show ritual? Drink some beers, chat with friends who turned up to see the show, and then jump around a bit and then warm up before doing our soundcheck/line-check. Do you have anything to add? Only that I believe everyone should do their best to support their local music scene.